Seeds that were gathered during the El Nino of 2009, including different species of Dipterocarpaceae (all closely related to the Lawaan), have flourished. With the high school students and the new program for the youth, there has been much discussion about how to assist the regeneration of the forest in the area that was once a barren log deck. Each weekend, the grass on the slopes by the Ki-asu and Hal-as streams is cleared. 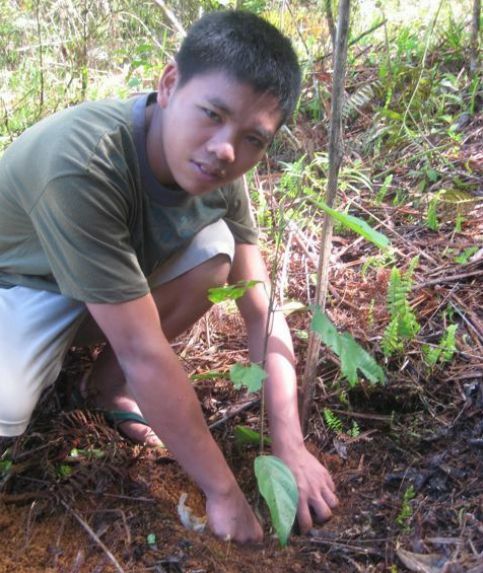 By the emerging scrub, lawaan, danguleg, ubanan, kaliyaan and other seedlings are planted. Over five hundred seedlings have now moved out from the nursery over the last few months to the hillside where the rains sustain them. We have received some specific support for this one area and we want to build a training program for the youth in the valley on how to sustain the forest and water for all.